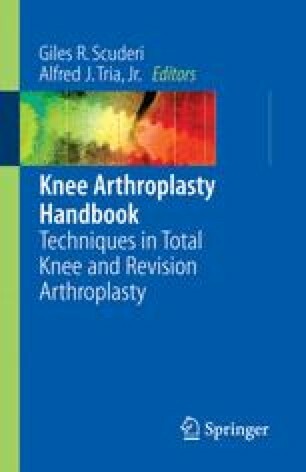 The problems related to preoperative flexion contractures of the knee for total joint arthroplasty increase with increasing degree of deformity. In general, the lesser deformities will correct with less surgical dissection through removal of osteophytes and the release of the posterior capsule. The deformities that are extensive and fixed will require wide soft tissue releases posteriorly and collaterally, as well as some proximalization of the joint line with increased resection of the distal femur. Postoperatively the patient should be protected so they do not develop recurrent deformities. This can be accomplished with casting and manipulations if necessary. The most serious complications involve stretching the neurovascular structures and must be very carefully evaluated in the postoperative period. Preoperatively, the patients with flexion contractures are so disabled with immobility states and significant restrictions in walking ability that, after surgery and full extension is achieved with a successful arthroplasty, they are amongst our most grateful patients.